Design your own mug – How to. One of the most fab things about the interweb, is that you can find instructions for creating just about anything, in this case, it is the various methods you can use to design your own mug. What is unique about this piece is that, I am going to introduce you to several different techniques available, which you can use to achieve this, as well as rating them on practicality, difficulty and longevity. This design technique has been all over the web for some time now, it is one of the most economical methods of getting a hand made designer mug, that said, it does have a few drawbacks which I will explain later. To create a Sharpie designer mug, you are going to need to get your hands on a sharpie pen and a blank mug, to use as your canvas. You can pick up good quality cheap mugs pretty much anywhere and the styles vary from standard straight sided Durham mugs, to the more aesthetically pleasing marrow mugs with shaped or contoured sides. …some of the available mug styles you can use to create your sharpie design on. Now the norm is to go out and buy plain white ceramic mugs and create the design using a black sharpie, but bear in mind that sharpies come in every available colour as well as black. You could, for instance, create a colourful design on a white mug, but look to buy the oil based sharpies, as they hold the design better once baked. Alternatively, you could use a coloured mug as the canvas, and create a simple black design or go mad with a heap of colour…it doesn’t stop there, you can also buy white sharpie pens which gives rise to a black mug white design option. So you have a number of different choices of mug style, mug colour and design colour…which should be enough to keep even the most creative designer happy. Create a mug using the sharpie technique. So you have all the ingredients required to create your masterpiece and now comes the fun part – using your creativity. At this point, unless you are someone who loves spontaneity and is confident in their craft, you may consider doing a little bit of research as to what you would like on it, and whether it will actually work to produce a pleasing design. If you decided to base your design on a mug with shaped sides like the latte or marrow mugs mentioned above, you are going to find it quite tricky to create a full wrap design because of the arched design shape. One way to overcome the curvature issue is to place the mug on a turntable and to rotate it as you create your design. If this is not something you are confident doing, then opt for the easier straight sided Durham mugs as these lend themselves to symmetrical full wrap designs. Once you have managed to create your masterpiece, it is then time to embed it onto the mug and you could use a crafter’s acrylic sealant spray, but the easiest and healthiest way to do this is to use heat. First leave the design to dry overnight, the next day place it in a cold oven and set the temperature, bake it for around half an hour at 180°C and then leave it in the oven until it is completely cool before removing. If you want to extend the life of the design even further you can bake it a second time to embed the design even further. And there you have it – your own designer sharpie mug. – Simple and cheap to create. – The designs will not withstand being put in a dishwasher and will fade even if hand washed. – Using acrylic sealant does mean your design will last longer but there are health issues if the rim of the mug is sprayed. – It is difficult drawing on a cylindrical surface as anyone who has tried this can attest. Great bit of crafty fun and can look fab and certainly original but, impractical to use and clean. The second technique on the list involves a two fold process, whereby you create the design, and then you pass the design onto a company like ourselves, who apply it permanently to a mug for you. To create your artwork firstly decide on the type of mug you want your design to be printed on to as we have two styles to choose from , earthenware ceramic 10oz mug or the smaller 7oz Fine bone china mug . If you are unsure which style you would like then there is no need to be overly concerned as all that will happen is that we will crop any excess parts of the design based on the pre determined print area of the mug that the designs is to be applied to. Basically, any part of a design that goes outside this area will then not be printed. To enable you to work within the required parameters you can either lay out the printable size as part of your artwork, (much like you would if you are working to a set canvas size) or alternatively you can download one of our Printable templates. If you decide to opt for the bigger than A4 option then you can use the following dimensions as your size guide which you can then scale up as required. The size of the printable area is: 200mm wide x 80mm high and you can use these dimensions to create a design for both ceramic and bone china mugs, (even though the print area is smaller for the bone china mug it is proportionally similar to the ceramic one to make them compatible). 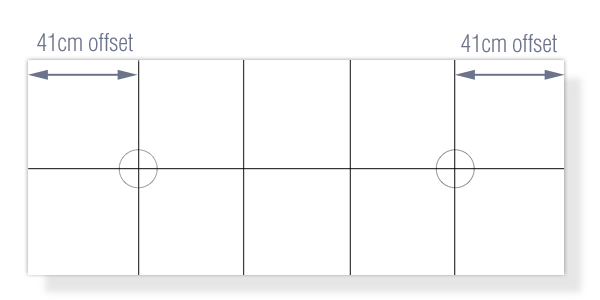 One final thing to bear in mind when using this bigger than A4 method, is that you need to take note of where the centers are for front and back placement. What I mean by that is, when you hold a mug by the handle there is effectively a left, right and front side to the mug. The measurements above are for a wraparound design – which goes all the way around the mug stopping short of the handle. So if you wanted your design to include elements that were positioned evenly on both sides of the mug, when someone was holding it, then there is an offset that needs to be taken into consideration to get this right. This offset is shown on the guide layer on the Photo shop templates and is approximately 41mm in from the outer edge. How to offset your mug design for better aesthetic balance. If you are happy creating your artwork on a smaller scale then you can download one of our printable templates which includes a full wraparound as well as front and back option. You should select the wraparound option if you are looking to create a sketch or drawing that uses up the whole printable area of the mug. If you would prefer to have a smaller design placed on both sides of the mug, then you can select the front and back template option, this will allow you to produce a single sided design which we will then print on both sides, saving you the need to duplicate the design for each side. This technique for creating your own designer mugs is great, if you have a little artistic flair and enjoy designing by hand, using pens, crayons, marker pens, oils, watercolours or even charcoals. It is also a brilliant technique for children as it allows them to have fun and be creative although you may find that getting them to stay within the crop area may be rather challenging. That said there is no need to be too careful as we will always tidy up a design if we feel it is warranted and if its a little flat due to the scanning process, we will add a little subtle contrast to make it more colourful, when printed onto a mug. They also make fab gifts to give to members of the family, and I can tell you from experience, they are a must have for proud grandparents. Once you have completed your design/s using either of the above printable templates, you will then need to scan the artwork, and upload it when placing your order – there is a file upload button on each of the Design your own mug category page that allows you to do this. For larger designs if you don’t have access to a large flat bed scanner, a workaround which is just as effective, is to send us a digital photograph of the artwork. If you use this method, then you will need to reduce the size of the digital image, before uploading to us with your order, as digital camera images are usually huge and we have a file upload size restriction of 6MB. If you don’t wish to reduce the size of your image, then you can always ignore the file upload option, and simply email us through your artwork as an attachment, once you have placed your order. And you can leave the rest, up to us…. – Produces a permanent designer mug of your own creation. – Can be given as unique personalised gifts. – Requires a little more technical ability than the sharpie version due to the need to scan and upload. – Takes a little longer as mug has to be printed and despatched to you. Produces a commercial quality mug containing your own bespoke artwork which can be used and cleaned as normal. 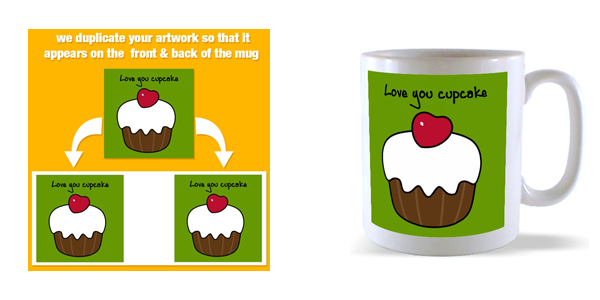 Design your own mug artwork using a graphics software program. This final technique – to design your own mug, is for anyone who is familiar with producing artwork using one of the many Computer Graphics software packages available. This includes Adobe Photoshop, Adobe Photoshop Elements, Coral draw & Serif Draw, as well as vector based packages like Illustrator. In fact you can use any package you like, as long as you can output the file in any of the formats we use which are; PDF, PSD, EPS, TIF, PNG, JPG and GIF files. If your file exceeds our 6MB upload limit, you can also compress it and send it to us in ZIP format. On opening the PSD file, you will see that they contain a number of layers which have been included to provide information and positional guidance. With regards to what you can create there are no restrictions because unlike screen printing, we can print to photo quality, which means you can include subtleties like gradients, mid tones, highlights & shadows in your design. 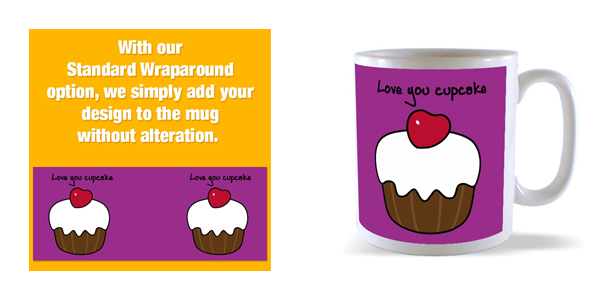 Simply put, anything you create we can replicate in print onto a mug. Once you have completed your design the grid and information layers can be deleted, as they are no longer required, and will only add to the file size when uploaded if you choose to send us a PSD version of your artwork. In fact it is preferable that you save a copy of your original PSD file and flatten it, prior to uploading it. This automatically reduces the overall size of the file, but also prevents any issues arising, if you have any font layers that use fonts we don’t have installed. On the subject of fonts, the fact that software programs like Photoshop allow for multiple text layers, means that it is really easy to create a range of personalised mugs around a single design. This is incredibly popular with a lot of our clients, as it can be used as a strong marketing tool because, it combines practicality of use and brand awareness. For example, giving a personalised mug to a client that also displays your corporate identity will ensure your brand is always on show, either in the office or on someones desk. Everyone loves a personalised mug, especially in offices as it stops others using them. Win win win! Finally, we are sometimes asked by customers to provide 3D mock ups prior to going to print but this is unfortunately too time consuming for us to offer. As an effective alternative, if you want to get an idea what you design will look like, get hold of a standard 10oz mug and print your design out using a normal printer onto A4, (ensure you do not have any resize options set in the print preferences window). The result will be a copy of your design which you can crop using scissors, and wrap around a mug, tape it in place to get an idea of what the final product will look like. Once you have uploaded your file and put through your order you can put your feet up and wait, for the postie to ring the doorbell…. – Ready to use Pre-made mug templates. – Allows you to create amazing digital artwork. – Text layers make the production of personalised mug designs a breeze. – Requires possession & knowledge of computer graphics program. Graphically created artwork lends itself to high quality mug design . And there you have a few of the techniques that can be used to design your own mug and create a practical and personalised masterpiece. If you decide to create a mug yourself good luck – if you would like us to create your mug for you then pop on over to our design your own mug page where you can select from a number of different options. Please feel free to add your own experiences both good and bad in the comments as well as any questions you might have. Wales defeated England RWC 2015 T shirt – Woop Woop!